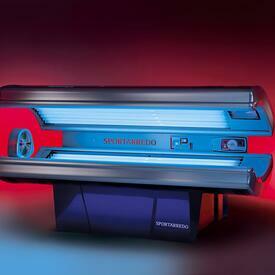 Are you frustrated by the lack of bells and whistles offered by most traditional tanning beds? Find the best, feature-packed experience money can buy with a 32 Bulb Tanning Bed! Our selections come loaded with special features, such as digital timers, lamp-hour counters and dual-power (pink and blue) lamps! Focus your color by utilizing the pink healing facial lamps to prevent wrinkles, while the blue lamps for your arms, legs and body give you that attractive, dark tan. Gain an extraordinary bronzing experience in only 15 minutes through a balanced blend of UV rays yielding that perfectly bronzed, radiant look. And our models are powerful, with one model showcasing built-in lamp reflectors that offer a 70% increase in bronzing power (with an additional 10% facial bronzing power) than the average lamps. These units offer up to 1000 hours (an estimated 30 years lamp life), so we promise they will stand the test of time.